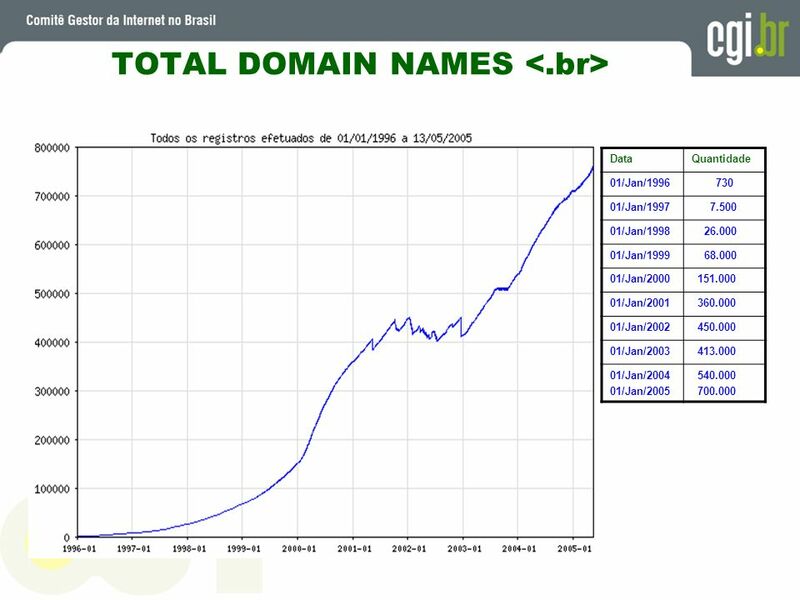 .com .de .net .uk .org .info .nl .biz .it .us .br .jp .de .uk .nl .it .us .br (~1.07%) .jp .kr .ca .be .fr .se .pl Top 10 of the ccTLDs are more then 71% of all ccTLDs. 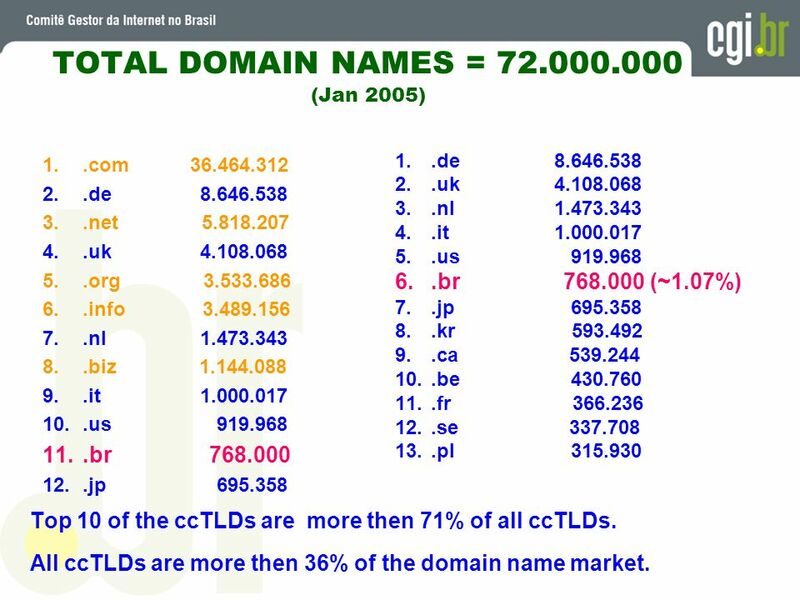 All ccTLDs are more then 36% of the domain name market. 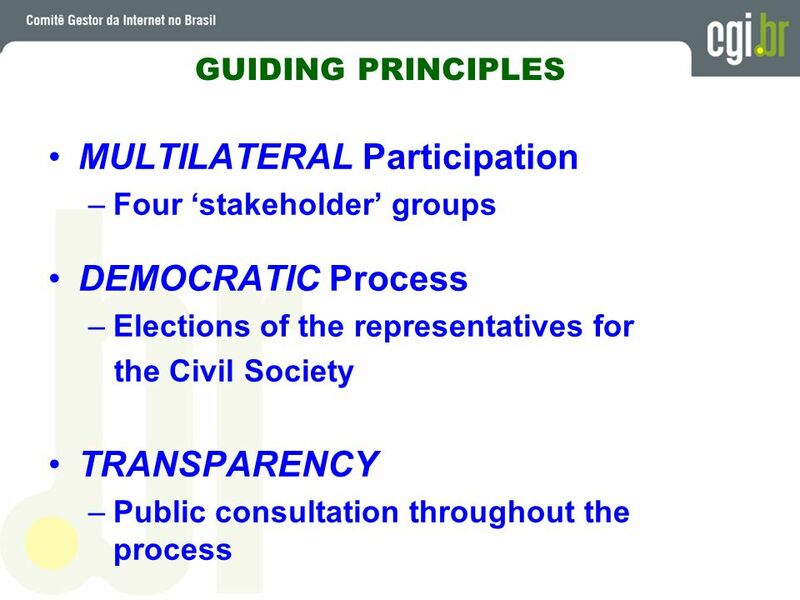 constituencies Private Sector => 4 segments Telecom Infrastructure Providers Internet Service Providers Hardware & Software Industries General Business Sector Users Organizations from the 3 sectors appoint candidates Elections process in two steps (electronic voting) during July 2004. 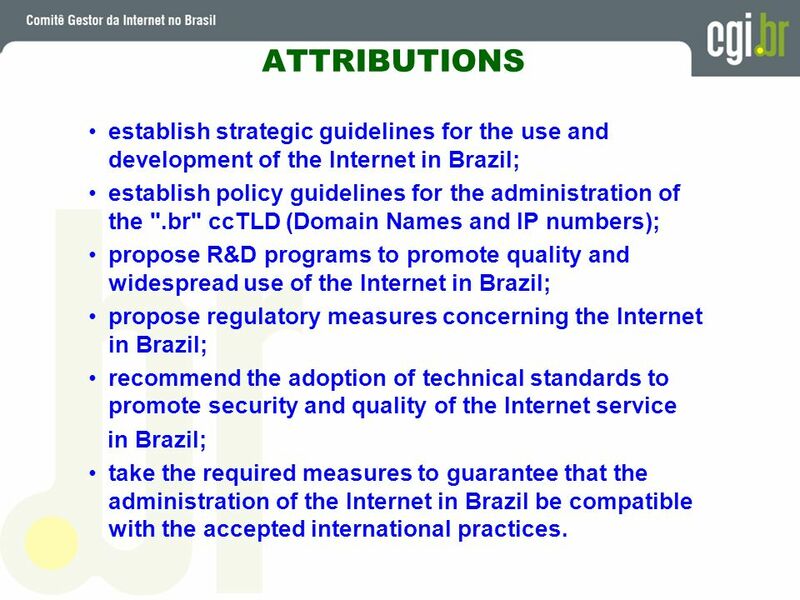 14 ATTRIBUTIONS establish strategic guidelines for the use and development of the Internet in Brazil; establish policy guidelines for the administration of the ".br" ccTLD (Domain Names and IP numbers); propose R&D programs to promote quality and widespread use of the Internet in Brazil; propose regulatory measures concerning the Internet in Brazil; recommend the adoption of technical standards to promote security and quality of the Internet service in Brazil; take the required measures to guarantee that the administration of the Internet in Brazil be compatible with the accepted international practices. 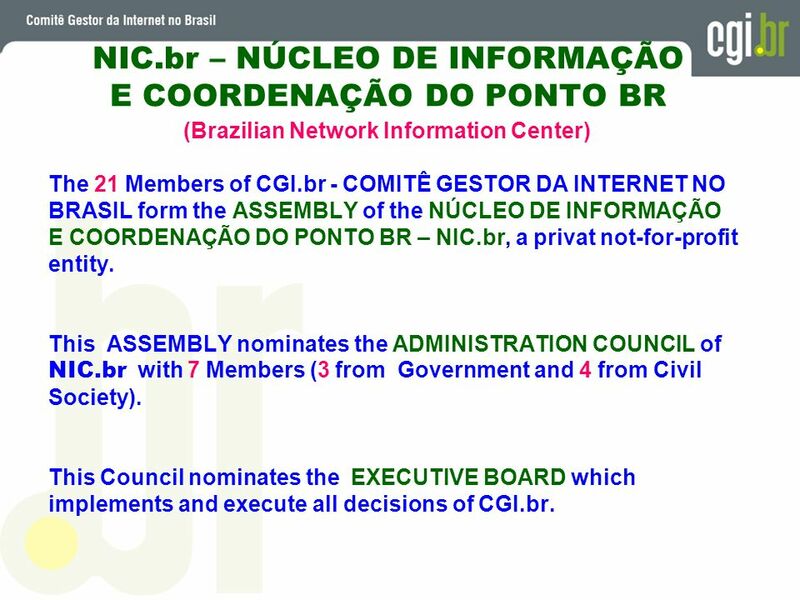 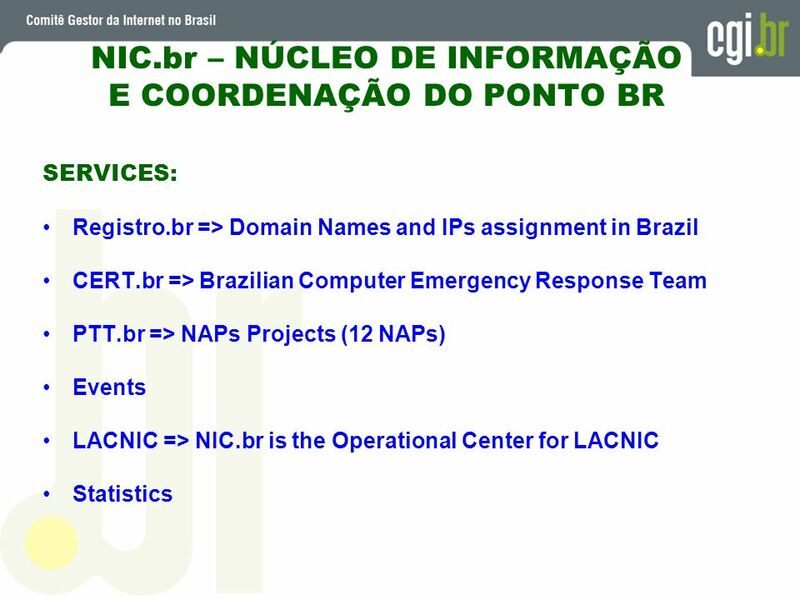 (Brazilian Network Information Center) The 21 Members of CGI.br - COMITÊ GESTOR DA INTERNET NO BRASIL form the ASSEMBLY of the NÚCLEO DE INFORMAÇÃO E COORDENAÇÃO DO PONTO BR – NIC.br, a privat not-for-profit entity. 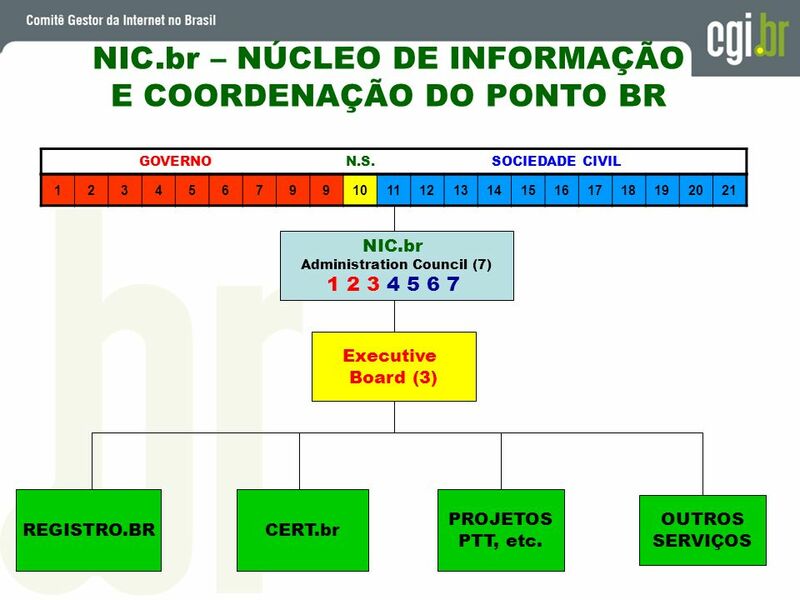 This ASSEMBLY nominates the ADMINISTRATION COUNCIL of NIC.br with 7 Members (3 from Government and 4 from Civil Society). 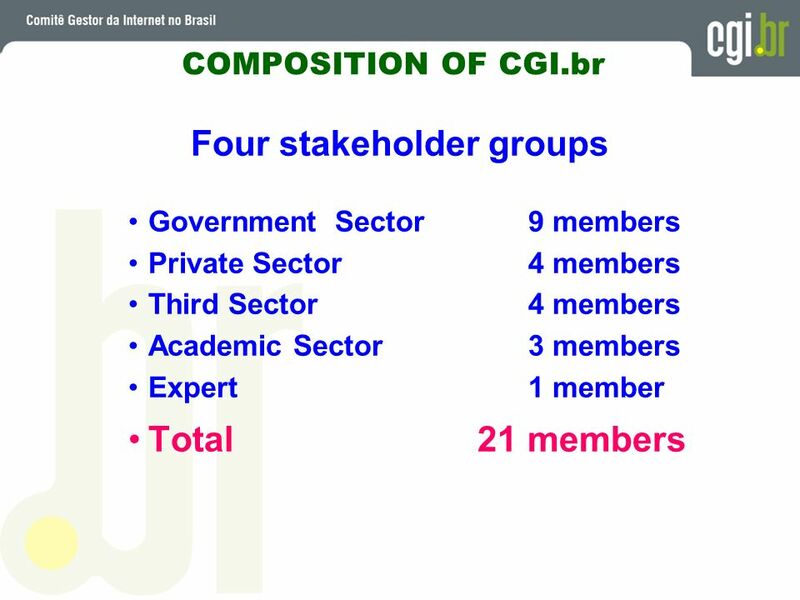 This Council nominates the EXECUTIVE BOARD which implements and execute all decisions of CGI.br. 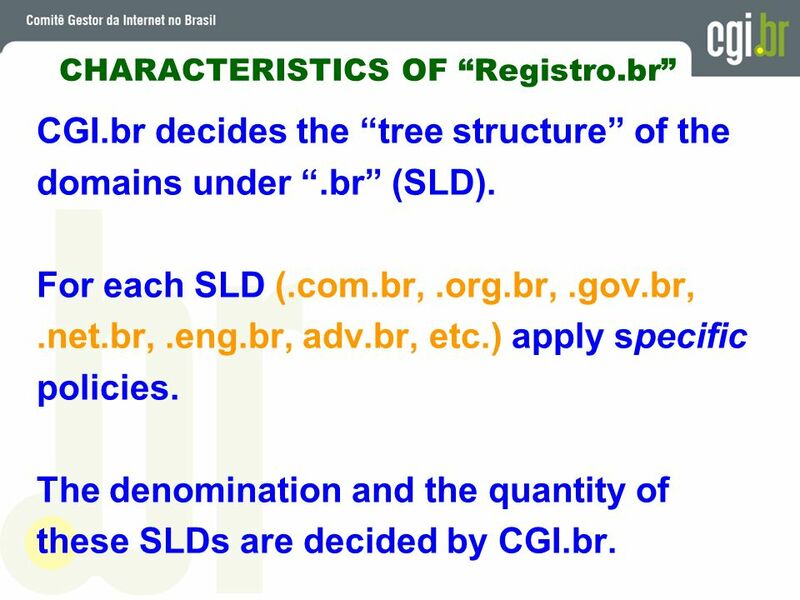 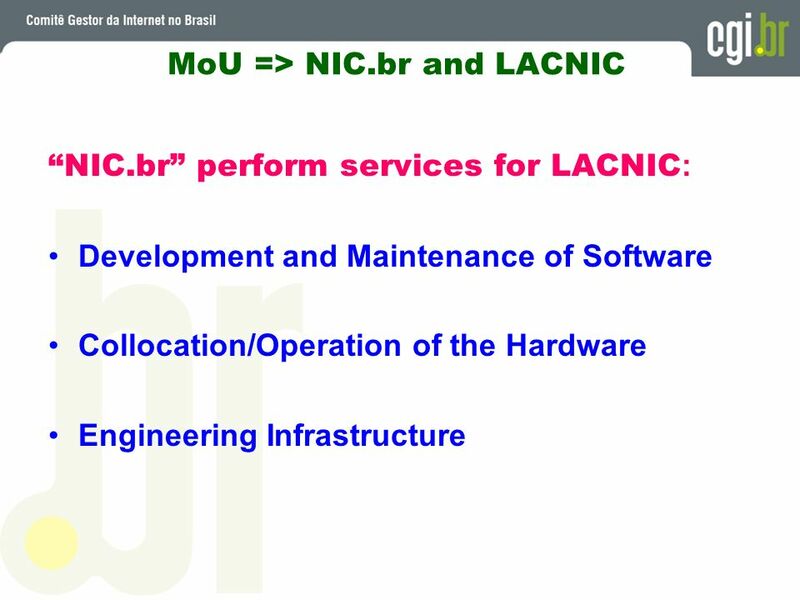 CGI.br decides the “tree structure” of the domains under “.br” (SLD). 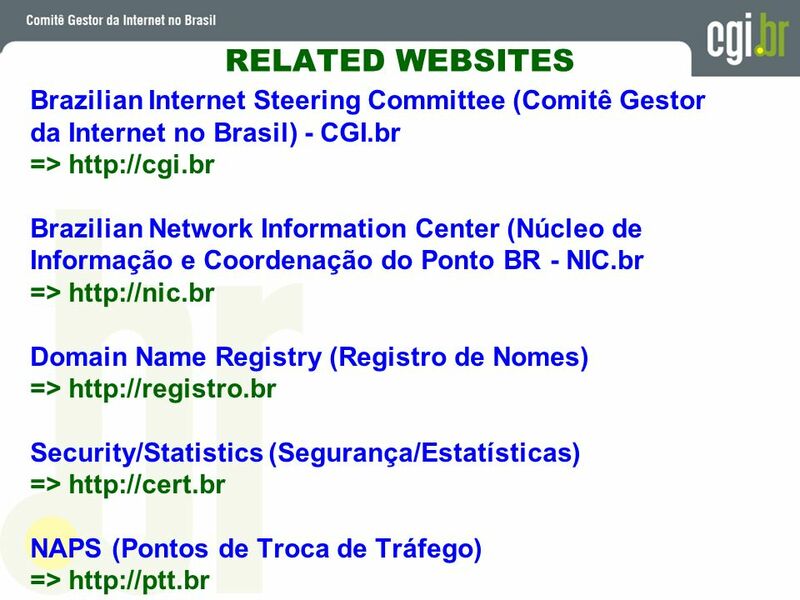 For each SLD (.com.br, .org.br, .gov.br, .net.br, .eng.br, adv.br, etc.) 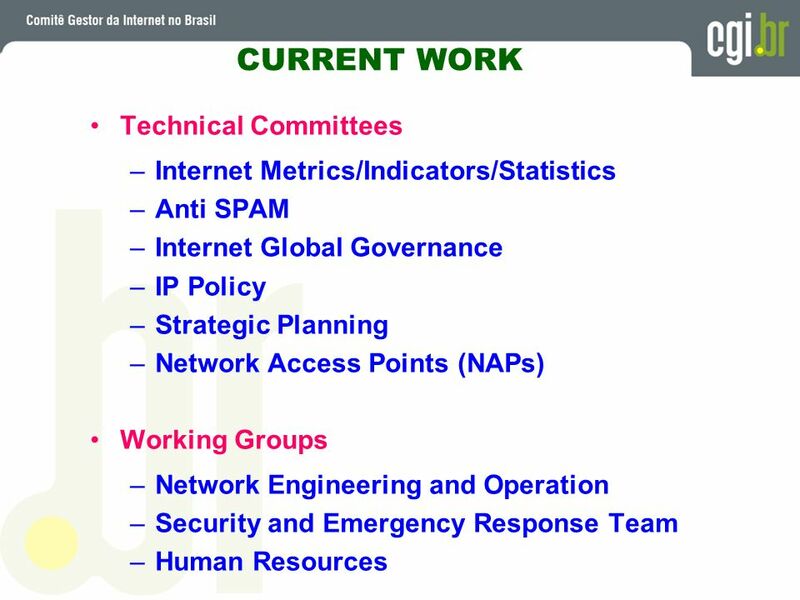 apply specific policies. 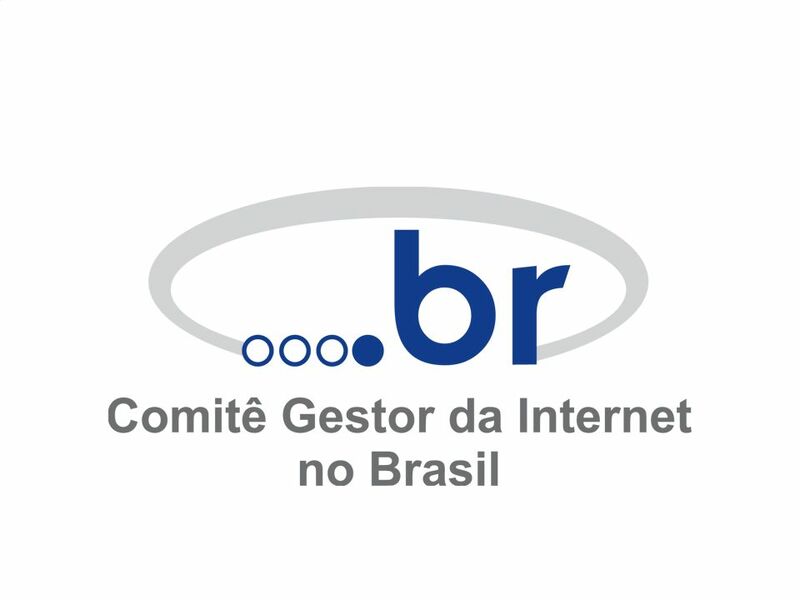 The denomination and the quantity of these SLDs are decided by CGI.br. 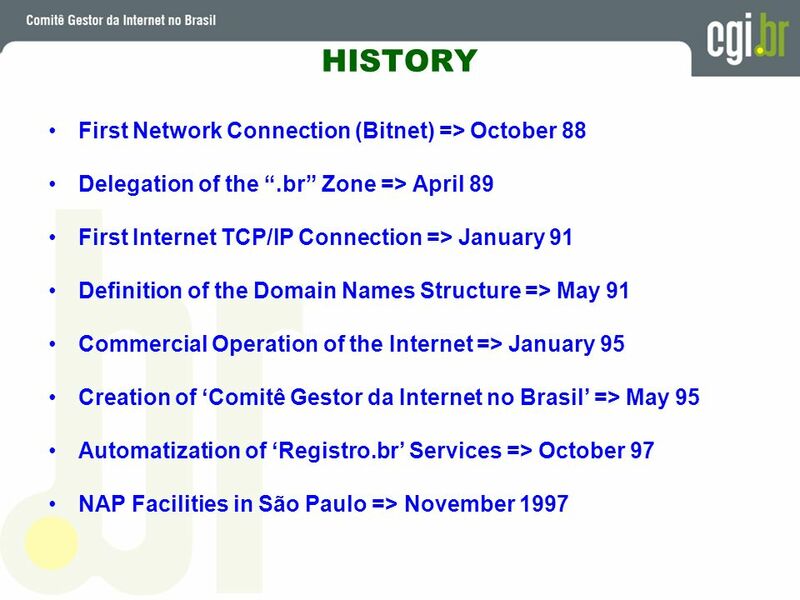 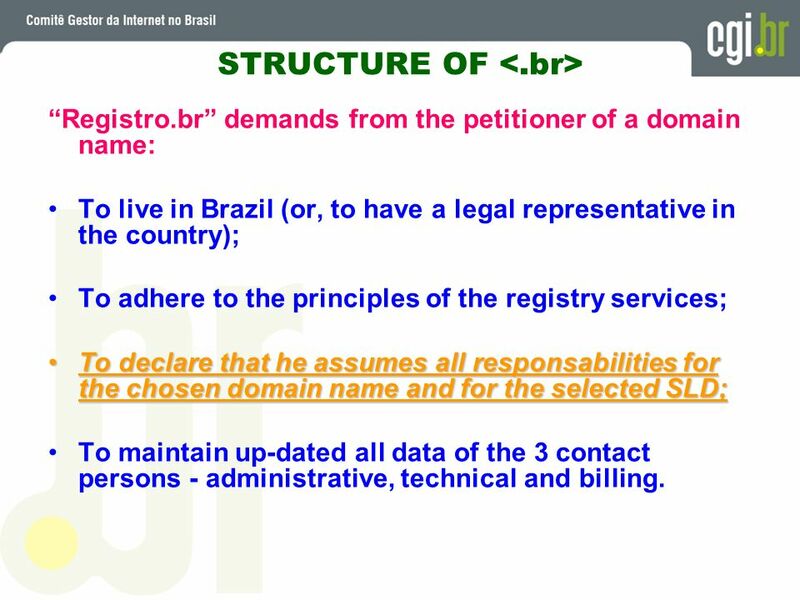 “Registro.br” demands from the petitioner of a domain name: To live in Brazil (or, to have a legal representative in the country); To adhere to the principles of the registry services; To declare that he assumes all responsabilities for the chosen domain name and for the selected SLD; To maintain up-dated all data of the 3 contact persons - administrative, technical and billing. 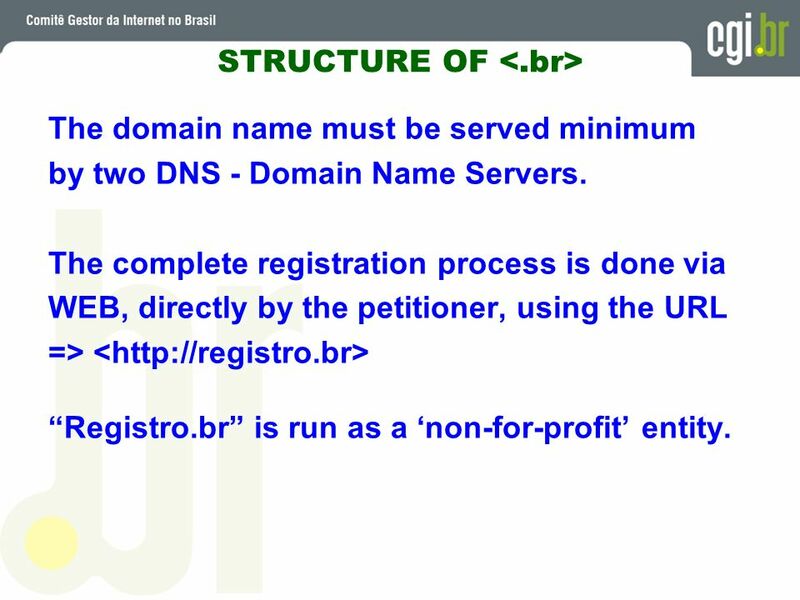 The domain name must be served minimum by two DNS - Domain Name Servers. 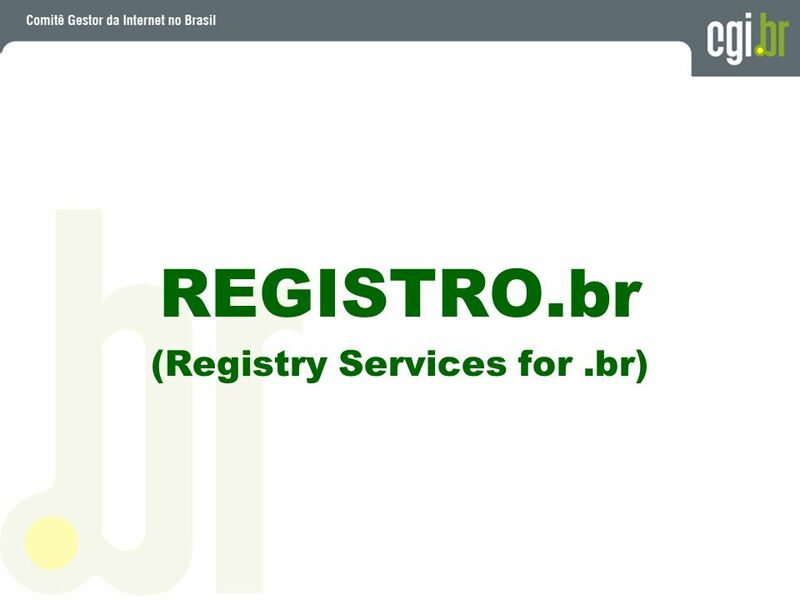 The complete registration process is done via WEB, directly by the petitioner, using the URL => < “Registro.br” is run as a ‘non-for-profit’ entity. 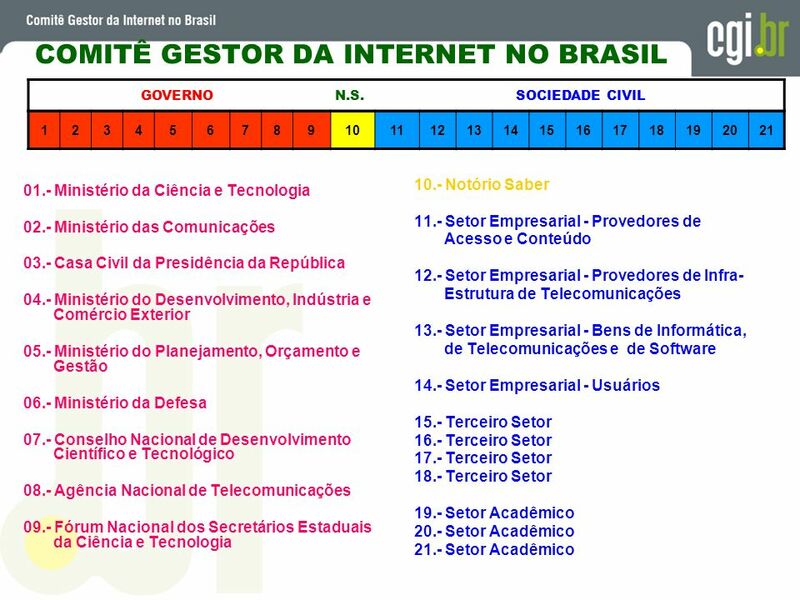 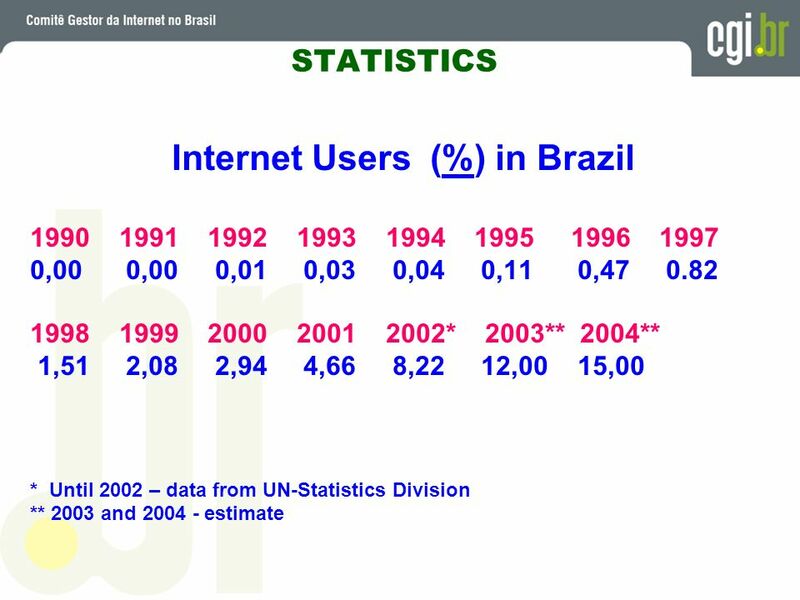 As atribuições básicas do GT-ER incluem: Planejamento da evolução de infra-estrutura e de serviços Internet no Brasil através de estudos, recomendações e de propostas de padrões comuns para protocolos e serviços; Recomendação de procedimentos administrativos para a alocação de endereços IPs e o registro de domínios para qualquer instituição solicitante no país; Recomendação de normas para a implantação e operação de Pontos de Troca de Tráfego - PTTs no Brasil; Participação e realização de eventos na área. 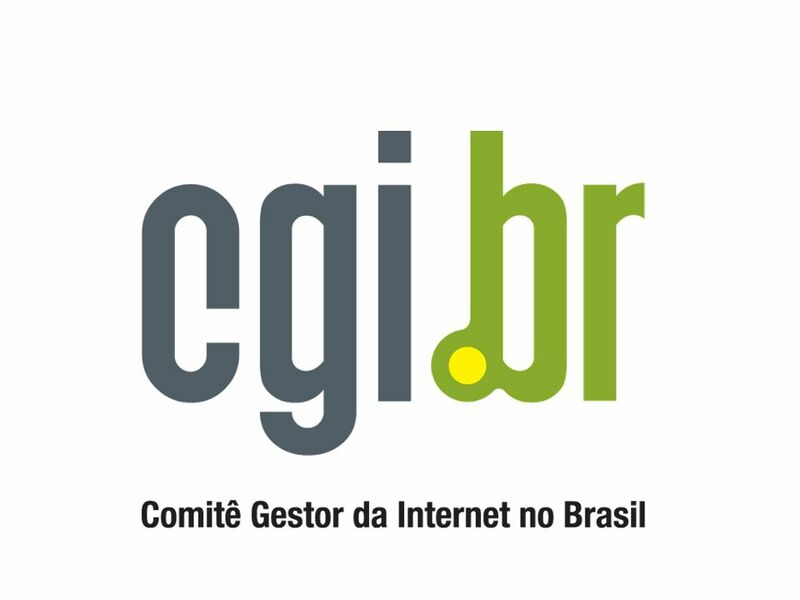 backbones => cujo principal objetivo é discutir a questão da segurança nas redes ligadas à Internet sob a ótica das redes provedoras de backbone, e provedores => com ênfase nos aspectos de segurança relacionados com as empresas provedoras de acesso à Internet. 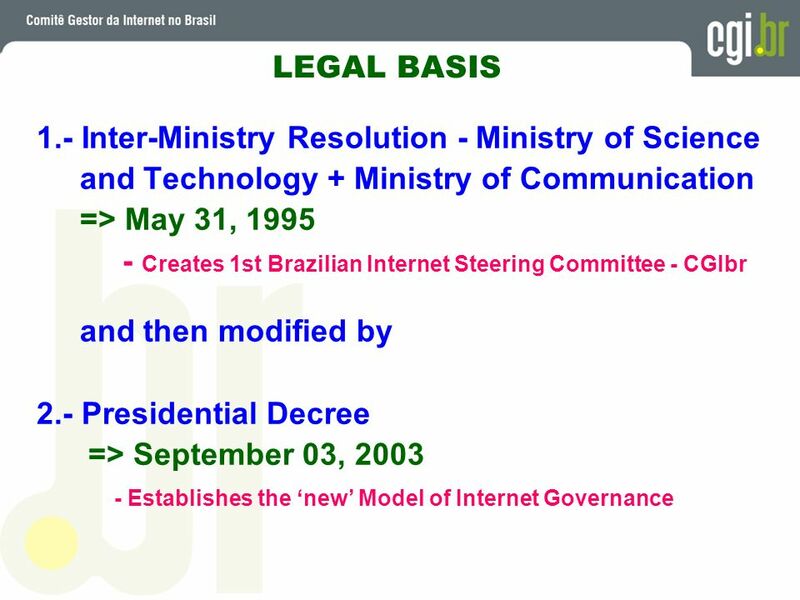 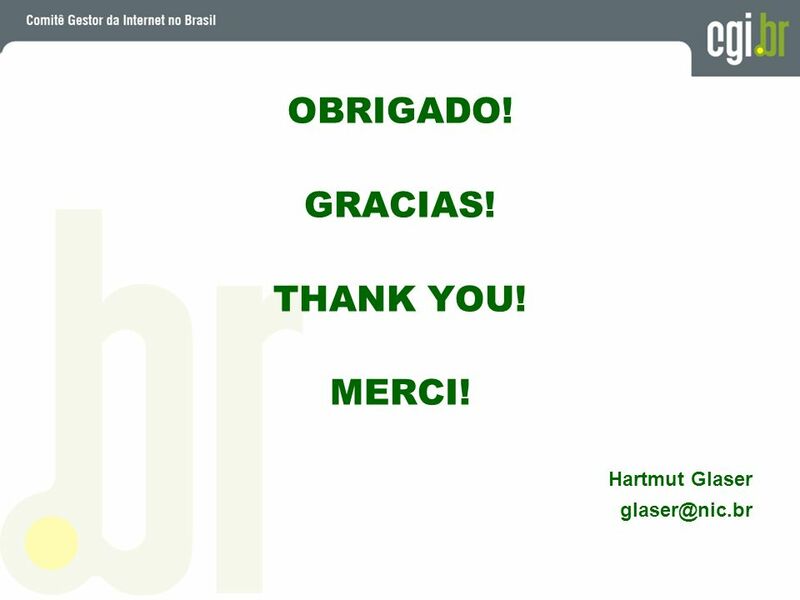 Carregar ppt "BRAZILIAN INTERNET GOVERNANCE MODEL Hartmut Glaser Executive Coordinator Brazilian Internet Steering Committee"
1 Evaluation of the Multiyear Plan José Paulo Silveira Ministry of Planning, Budget and Management Secretariat for Planning José Paulo Silveira.